An overhead sectional providing sound and heat insulation with its composite panel construction. Double Skinned steel sections with PU foam infill, with an interlocking hinge joint. Our sectional Doors come in a standard panel thickness of 42mm and 67mm for the best thermal insulation. 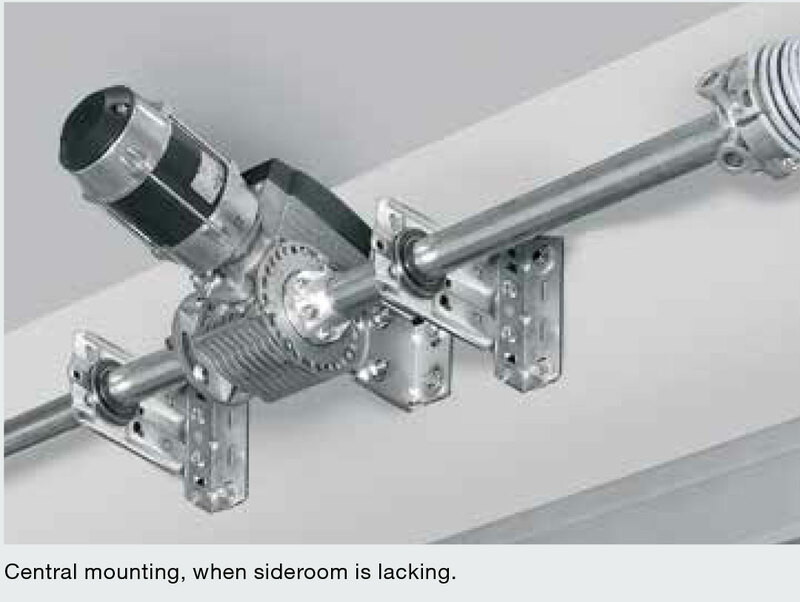 The sectional doors open vertically, using a curved overhead track, ideal for limited headroom. The Sectional Doors are available with a wide range of options ie; Glazing Panels, Wicket Doors, Single and 3 Phase operators and colours. A popular choice for Showrooms, Warehouse, Distribution Depot and Industrial applications. Panels come in a range of 10 standard colours, with the inside supplied in Grey White RAL9002. Others colour available at an extra cost and extended lead times. 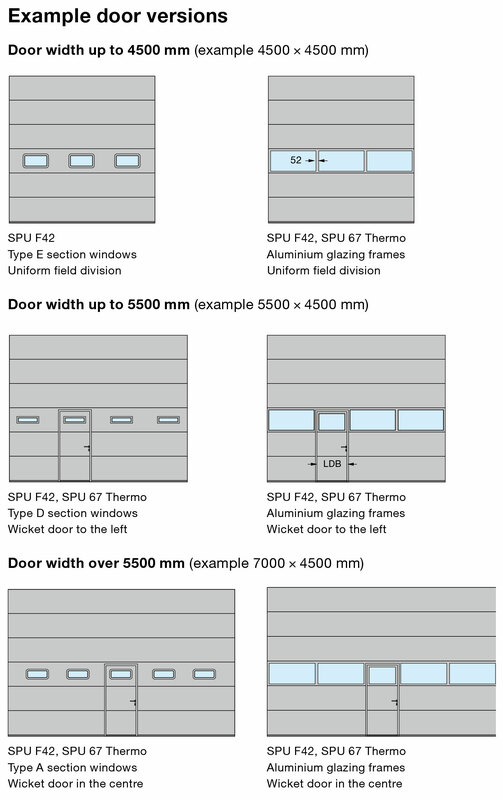 PU-foamed sectional doors are available either with 42 mm depth or with sections with thermal break and 67 mm depth. For both versions, the door appearance is 100 % matching. 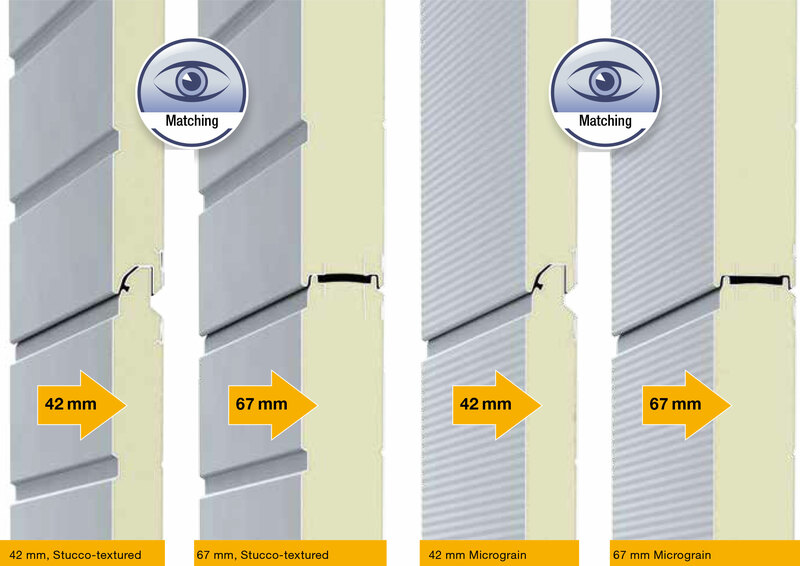 Hörmann sectional doors with 42-mm-thick PU-foamed sections are especially robust, offering good thermal insulation. The surface finish of the sections of steel doors or doors with bottom sections is based on hot galvanized sheet steel and a high-adhesion primer coating (2-component PUR) that protect the door against adverse effects of the weather. Additionally, Stucco texturing gives the door surface a uniform structure on which light scratches or traces of dirt are more difficult to see. white, RAL 9002, as standard. Whichever door type you have selected for your building: At Security Direct, you will find the track application to match your door. 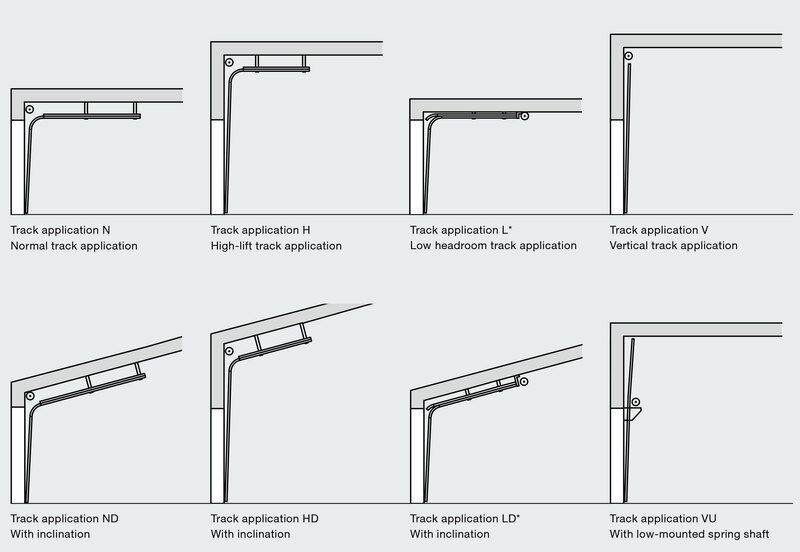 Depending on the building architecture and requirement, you can choose between standard and low headroom track applications, low headroom track applications or inclined track applications. 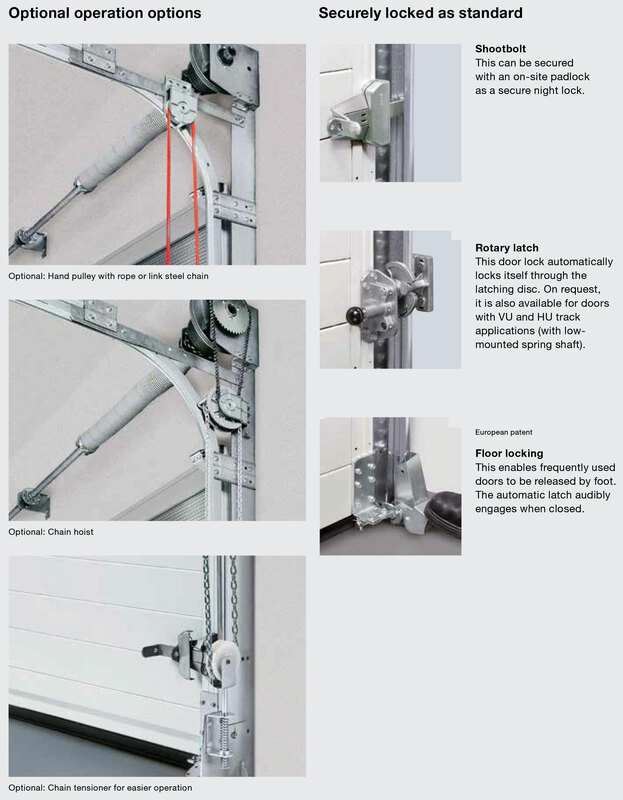 Well-insulated industrial sectional doors are essential in heated buildings. 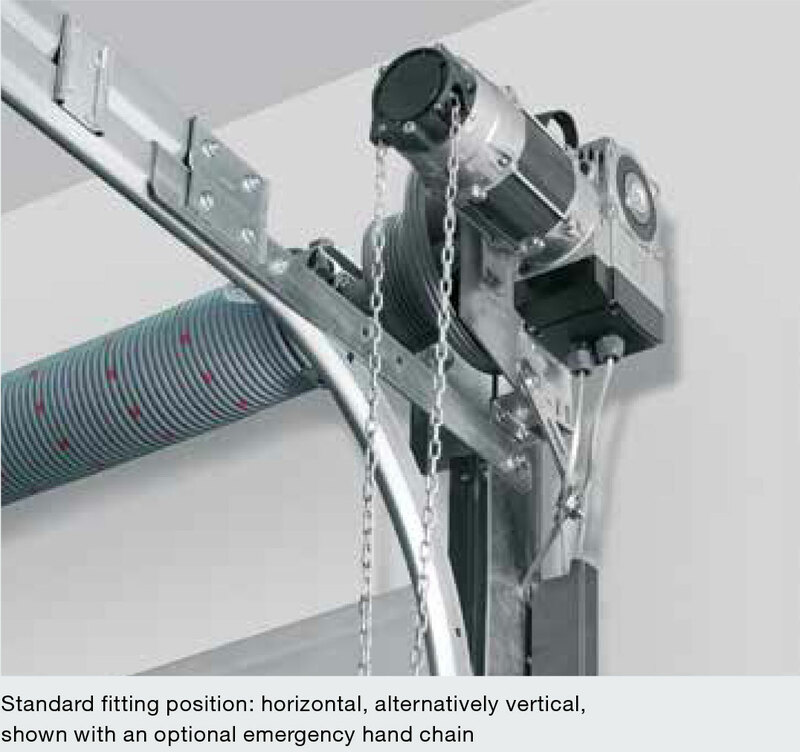 This is why Hörmann industrial sectional doors come with an optional ThermoFrame frame connection with a thermal break between the frame and brickwork. The lip seals on both door sides and the top section of the door provide additional insulation. This way you can decrease the thermal value by up to 21 %. SINGLE AND 3 PHASE MOTORS - We have a range of Single (240V) and 3 Phase (415V) motors. 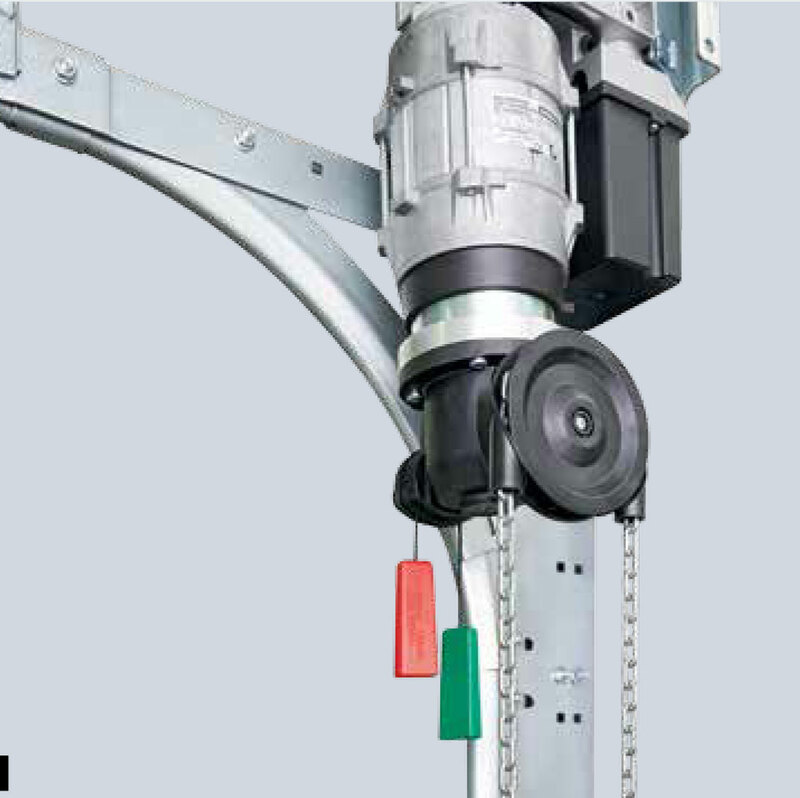 The motor is selected depending on the Size of the Door, Operation per Hour, Operating Speed, Track Type and Room available for the motor. The 2-component PUR coating on the exterior or on the exterior and interior and the coil coating procedure for double-skinned sections in preferred colours ensure high quality, long-lasting colour. This maintains the attractive appearance of your door. 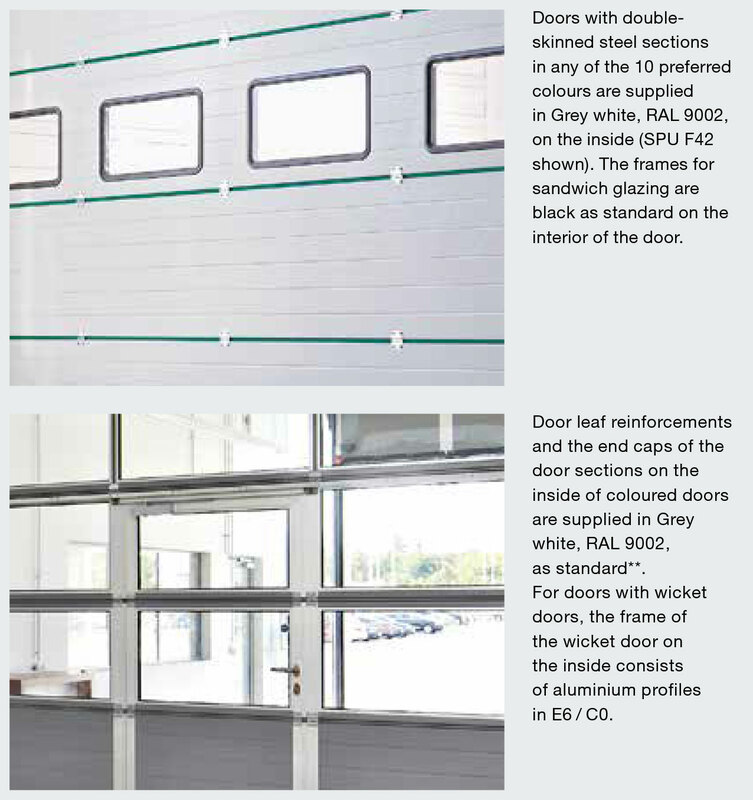 In addition you can receive the following with optional colour coating: wicket door frame profiles (external), leaf frame and frame of the side doors NT 60 and NT 80 Thermo, aluminium glazing frames, glazing beads, external frame of the sandwich glazings type A (diecast frame) and type D (plastic frame).